Melt the butter in a large saucepan over medium heat. Add the leek, potato and garlic and cook, stirring, for 5 minutes or until leek softens. Add the wine and bring to the boil. Cook, stirring occasionally, for 1-2 minutes or until wine reduces by half. Add the asparagus and stock and bring to a simmer. 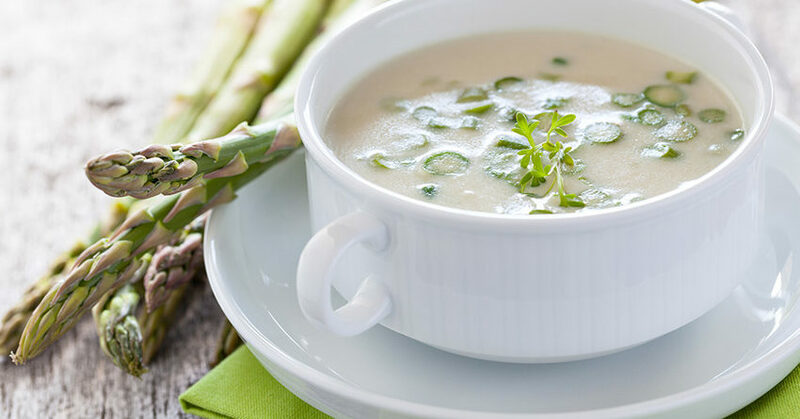 Cook, stirring occasionally, for 5 minutes or until potato and asparagus are tender. Remove from heat. Set aside for 5 minutes to cool slightly. Transfer the soup to the jug of a blender and blend until smooth. Return to a clean saucepan and place over medium heat and cook, stirring, for 2 minutes or until heated through. Add the cream and stir to combine. Taste and season with salt and pepper. Remove from heat. Ladle soup among serving bowls. Top with dill and serve immediately.